Naddod (Old Norse: Naddoðr or Naddaðr, Icelandic: Naddoður, Faroese: Naddoddur, literally "studded") was a Norse-Faroese Viking who is credited with the discovery of Iceland. Naddod was also one of the first settlers on the Faroe Islands after Grímur Kamban became the first to settle there around 825. Naddod was born in Agder, which comprises the two Norwegian counties of Aust-Agder and Vest-Agder. Landnámabók, a medieval Icelandic manuscript, describes in considerable detail the settlement (Icelandic: landnám) of Iceland by the Norse in the 9th and 10th century. 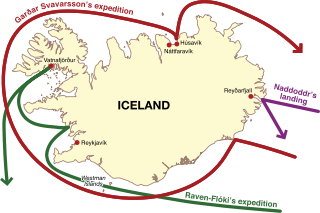 According to Landnámabók, Iceland was discovered by Naddod, who was sailing from Norway to the Faroe Islands, but got lost and drifted to the east coast of Iceland. Naddod came upon the shore of a land with a bay and mountains near what is today the Icelandic town of Reyðarfjörður. Although he climbed a mountain to look for smoke rising from fireplaces he saw no sign of humans. Naddod decided to continue his journey to the Faroe Islands, but as he returned to his boat it started to snow and so he named the land Snæland (Snowland). The island later became known as Ísland (Iceland). (See names of Iceland). Naddod is probably the father of Ann Naddodsdóttir from Shetland. Naddod has distant relations to Erik the Red and his son, Leif Erikson. ^ "The First Settlers". The Settlement of Iceland. ^ "Thorvald Asvaldsson | Mediander | Connects". Mediander. Retrieved 2015-10-27. O'Donoghue, Heather (2004). Old Norse-Icelandic literature: a short introduction. Wiley-Blackwell. This Faroese biographical article is a stub. You can help Wikipedia by expanding it. 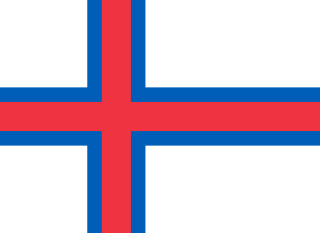 Venceslaus Ulricus Hammershaimb was a Faroese Lutheran minister who established the modern orthography of Faroese, the language of the Faroe Islands, based on the Icelandic language, which like Faroese, derives from Old Norse.